This week’s offering is clay: hand-dug, local. 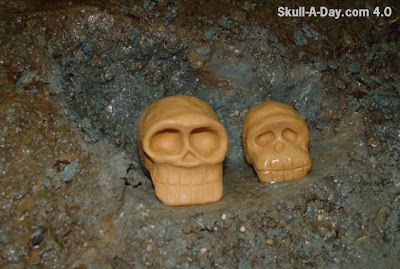 “Missing Links” 2" x 2" x 3" & 1.5" x 1.5" x 2" molded, hand-dug, local river clay. I was out by the river searching for fossils when I came across this exposed mass of clay in the river bank. Fossil hunting quickly took a back seat as I began to poke at the slippery area dislodging a nice chunk of clay. My thoughts turned to civilizations of the past and how they were able to create the things that they needed to survive with similar material. Sitting there by the river bank using only my hands and some small rocks, I let my primal instincts take over. I made art just like my forebears did. I went today looking for evidence of the past, and it appears I found it in myself. My weekly offering of original skull designs were posted on Mondays in year 3.0, and now I am posting them each Wednesday during year 4.0 . Knowing the personal pressures of a creating a piece each week, I tip my hat to the massive one-a-day project that was undertaken by The Skullmaster, during the original Skull-A-Day year. Hopefully you will find some nourishment in my weekly offerings, but if you need more nourishment during the week, you may always Friend me or Follow me. I'm so glad you're continuing to do your weekly skulls this year! I love them both. I like seeing the different natural clay that you have. Yours is paler than our red clay is.